Revive is a respite program for families with special-needs children which allows parents to drop off their loved-one and go out to dinner, see a movie or just rest. The children are loved on and cared for by experienced staff that are trained in working with special-needs individuals of all ages. 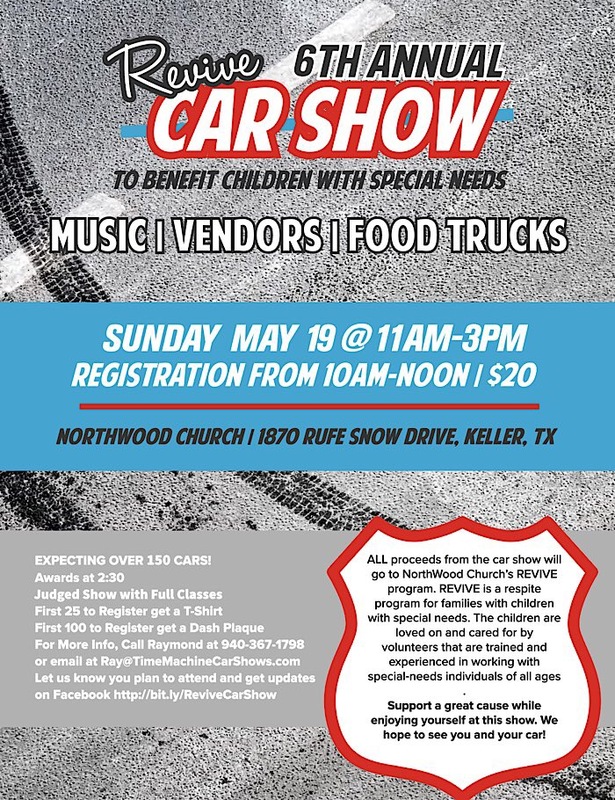 Show scheduled for Sunday May 19th, 2019. “Rain or shine” so hopefully shine! Registration 10:00 am to Noon. Show goes from 11:00 am to 3:00 pm. Awards at 2:30 pm. Full show with over 50 awards, including Best-Of Awards. Vendors, Music, Food Trucks. 50/50 Raffle. Tee Shirts to the first 25 entrants and Dash Plaques to the first 100 entrants. McDonald’s Breakfast or Lunch Sandwiches to the first 25 entrants. $20 Entry fee and proceeds go to the ministry. The show is free to spectators. We are expecting about 150 cars and over 1000 spectators. So come out and help raise money for this great cause.